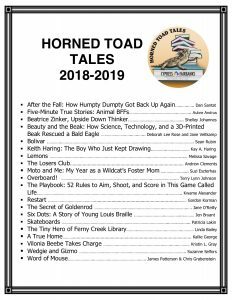 I’m honored that a team of librarians from the Cypress-Fairbanks ISD in Houston, TX chose 5 Minute True Stories: Animal BFFs as a 2018-2019 Horned Toad Tale Award list title. The committee’s mission is to find quality literature appropriate for third, fourth, and fifth grade students. The goal is to have a list of books to encourage and capitalize on the love of reading for students. In March of 2019, students from 56 elementary schools will vote on their favorite book! (Each child who votes is required to have read at least five of the books.) Can’t wait to see the winners!